The 2014 World Series of Poker has seen the biggest tournament outside of the Main Event come to a conclusion with Frenchman Hugo Pingray winning Event #51: $1,500 No-Limit Hold'em Monster Stack for an incredible $1,327,083. A vast majority of poker players had circled this very event on their calendar as a must-play, and the day before cards would hit the air, the mass of people entering caused the WSOP staff to add a second Day 1 flight. The opening day of Thursday last week would see two starting flights split into an afternoon and nighttime session as a massive 7,862 players took to the felt to create a $10,613,700 prizepool. It wouldn't be until late on Day 2 that 792 players would make the money following six eliminations on the hand before going hand-for-hand. Day 3 would be the moving day as the 576 remaining players would be cut down to just 62 before the penultimate day saw a final nine reached in a relatively quick time. Returning on Monday afternoon, the final nine took a seat at one of the biggest final tables of the summer, but unfortunately for Joshua Hillock he would be eliminated on the first hand when his was cracked by Day 3 chip leader Sean Drake. Ten hands later, Zachary Gruneberg exited in eighth place when he four-bet shoved the and ran into Pingray's queens, and then Bobby Byram fell in seventh a few hands later. Several orbits later, England's Lynne Beaumont lost a race with the against Pingray's before Thayer Rasmussen took fifth when his weak ace was outdrawn by Drake on the river. Thirty-seven hands later, German Claas Segebrecht made a move with the , but ran into Joseph McKeehen's to leave three men to battle it out until that became two just several hands later when Drake pushed with a flush draw, but ran into Pingray's two-pair. With Pingray holding nearly a 2-1 chip advantage to start heads-up play, that slowly increased until McKeehen snagged a huge double when he won a race holding the against Pingray's to take a greater than 2-1 advantage into the dinner break. Once play returned, McKeehen extended his lead until another coinflip saw the chip counts return to virtually dead even when Pingray's top pair held against McKeehen's flush draw and overcard. McKeehen snatched a slight lead back before Pingray won a monster pot when he made a backdoor flush holding the to move into a 2-1 advantage before the final hand would occur just nine hands later when McKeehen shoved all in holding the and Pingray called with the . The flop brought an an ace, and with it saw McKeehen exit in second place as Pingray was crowned champion. 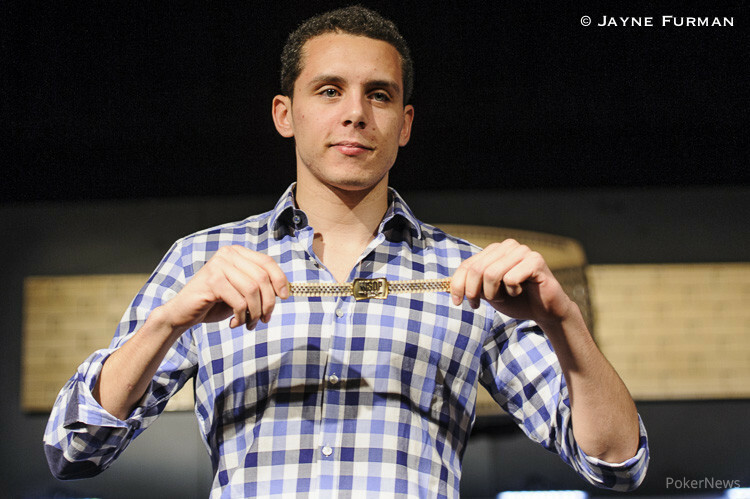 For the Frenchman, who now resides in Switzerland, this not only marks his first WSOP bracelet, but also his first WSOP cash and first cash outside of France or Switzerland. After showing a tremendous mix of patience, aggression, and well-executed timing on Day 4 to end the day as chipleader, Pingray carried that momentum into the final table. Although he relinquished the lead on several different occasions, his boisterous rail helped lift him to victory after an enduring 79 hands of heads-up play against a very talented opponent. Congratulations to France's Hugo Pingray for winning Event #51: $1,500 No-Limit Hold'em Monster Stack for a whopping $1,327,083 in prize money! Thanks for following along with our coverage during this tournament, and make sure to stay tuned to PokerNews.com for all your 2014 World Series of Poker coverage! Joseph McKeehen Eliminated in 2nd Place ($820,863); Hugo Pingray Wins! Hand #174: Hugo Pingray raised to 4 million from the button and Joseph McKeehen pushed all in for 45.85 million with Pingray instantly making the call to put McKeehen at risk. With McKeehen trailing in both chip count and hand strength, the dealer fanned a flop to put Pingray squarely in the lead as his boisterous rail launched into a bevy of cheers. McKeehen would now need a runner-runner combination of straight cards, trips or two-pair, but when the landed on the turn, he would be drawing dead as Pingray ran to his cheering rail to celebrate. The meaningless landed on the river and McKeehen would take 2nd place for a $820,863 payday as Pingray would be crowned the Event #51: $1,500 No-Limit Hold'em Monster Stack Champion! "But all the while you hear the creature creepin' up behind...You're out of time..."
Hand #168: Hugo Pingray limped the button, Joseph McKeehen raised out of the big blind and Pingray folded. Hand #169: Joseph McKeehen raised to 4 million on the button and Hugo Pingray called from the big blind. They checked to the river of a where McKeehen took it down with a bet of 2.5 million. Hand #170: Hugo Pingray limped the button, Joseph McKeehen checked his option and the flop fell . McKeehen check-called 2 million to see the turn, which both checked. The river fell and McKeehen check-folded to a bet. Hand #171: Joseph McKeehen raised to 4 million on the button and Hugo Pingray called from the big blind. They checked to the river of a board where Pingray took it down with a bet of 2.5 million. Hand #172: Hugo Pingray limped the button, Joseph McKeehen shoved for 33.75 million and Pingray folded. 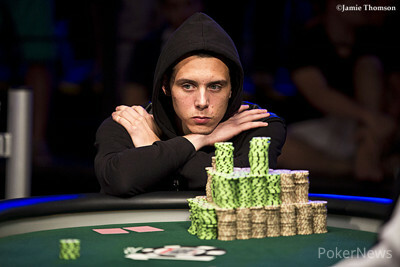 Hand #173: Joseph McKeehen raised to 4 million on the button and Hugo Pingray three-bet to 9.5 million. McKeehen four-bet shoved for 36.05 million and Pingray folded. "You hear the door slam and realize there's nowhere left to run..."
Hand #163: Hugo Pingray received a walk. Hand #164: Pingray raised to 4 million from the button only to have Joseph McKeehen three-bet to 10.5 million. Pingray folded and McKeehen folded. Hand #165: McKeehen raised to 4 million from the button and Pingray called to see a flop fall. Both players checked as the landed and Pingray checked to McKeehen who led for 5.2 million. Pingray made the call as the completed the board on the river. Pingray checked for a third time and McKeehen pushed out a bet of 7.6 million. Pingray went into the tank for close to a minute before announcing a raise to 19 million total. McKeehen now took his time to deliberate before making the call. 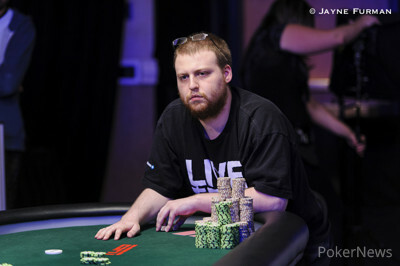 Pingray tabled his for a runner-runner flush to scoop the pot and move to over 81 million in chips. Hand #166: Pingray raised the button and McKeehen folded. Hand #167: McKeehen pushed all in from the button and won the big blind and antes. "You're fighting for your life inside a killer, thriller tonight..."
Hand #158: Hugo Pingray raised to 4 million on the button and took down the pot. Hand #159: Joseph McKeehen raised to 4 million on the button and Hugo Pingray called from the big blind. The flop came down and Pingray check-called 2.5 million from McKeehen to see the turn. Pingray then check-folded to a bet of 6.2. Hand #160: Pingray opened to 4 million on the button and McKeehen called from the big blind. 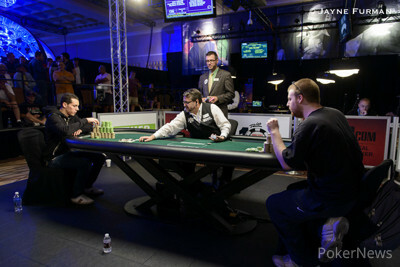 The flop fell and McKeehen check-folded to a bet of 4.75 million from Pingray. Hand #161: Joseph McKeehen raised to 4 million on the button and Hugo Pingray called from the big blind. The flop came down and Pingray checked to McKeehen who bet 2.5 million. Pingray check-raised to 6 million, McKeehen reraised to 12 million and Pingray folded his cards. Hand #162: Pingray opened to 4 million on the button and took down the pot. Bring on the 250k Chips! Monster Stack Final Table Almost Set to Begin! 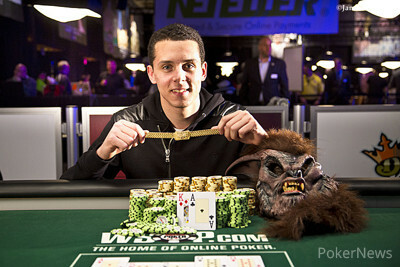 Hugo Pingray Leads Monster Stack Final Table!